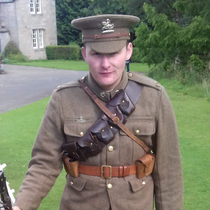 The uniform and equipment supplied to keep the soldier in the field, ready to fight, clean, fed and watered. Two cartridge pouch sets, each set consisting of 5 pouches and each pouch holding three 5-round charger clips; 150 rounds of rifle ammunition in total. One entrenching tool with separate carriers for the head and helve. 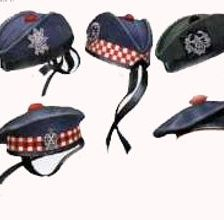 The majority of soliders wore an outwardly similar uniform, with the exception of 'Highlanders' with their kilt, the basic kit was a khaki serge single-breasted four-pocket jacket with stand and fall collar which was had cutaways for Scottish troops. 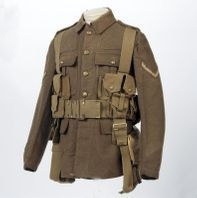 Lighter uniforms were issued for hotter climates, such as Gallipoli, ironically, it was very cold there in Winter. In winter soldiers might wear greatcoats, long serge coats which were very warm, or leather jerkins, which were originally intended to be worn under the jacket for warmth, but which proved very popular as a waterproof outer layer. Hard wearing and practical as they were, the trousers, and underwear won beneath could make a man incredibly hot and itchy. On a cold day though you would be glad of them. The kilt, worn by Highland soldiers, was surprisingly warm, however the pleats provided the perfect place for lice to lay their eggs. Mud also tended to dry on the hem and cut the soldiers' legs as they marched. Soldiers wearing kilts were not usually issued underwear. Puttees, a Hindi word were a covering for the lower part of the leg from the ankle to the knee. It consisted of a long narrow piece of cloth wound tightly and spirally round the leg, and serving to provide both support and protection. It was worn by both mounted and dismounted soldiers. The 1908 equipment, when fully assembled, formed a single piece and could be put on or taken off like a jacket. 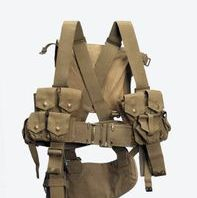 Ammunition was stored in two sets of pouches attached to the belt at the front, and the straps from these passed over the shoulders, crossing diagonally at the back. The back pack, or "valise", was attached to these diagonal straps, thus spreading its weight. 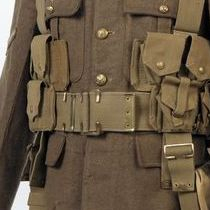 The earlier 1903 webbing had much more leather items, it was not as practical or popular as the 1908 webbing,but remained in service with 2nd Line TF and other home service units. Designed to hold a man's personal items, spare socks etc and small items of food. Everything required to keep a man clean and healthy. Or as it was otherwise know, the Hussif, provided to repair a mans clothes on active service. A gift at Christmas 1914, once empty it became a handy tin to keep 'baccy' and the like dry. 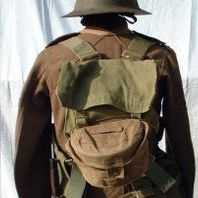 The haversack was carried by the soldier either on the left hand side hanging from the belt when in marching order, or on the back when in battle order. 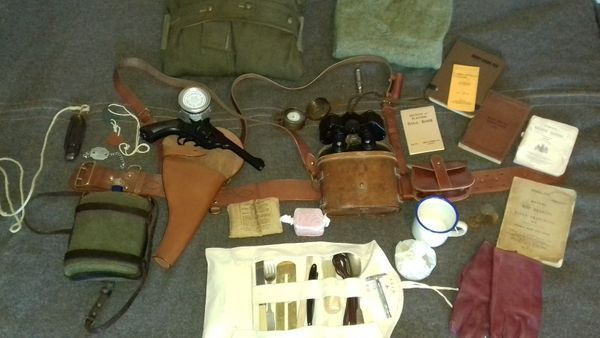 Inside the soldier normally carried all his personal items like hard rations, washing kit, rifle cleaning kit, spare socks and writing equipment. Over 3,000,000 tons of food was sent from Britain to the soldiers fighting in France and Belgium during the Great War. 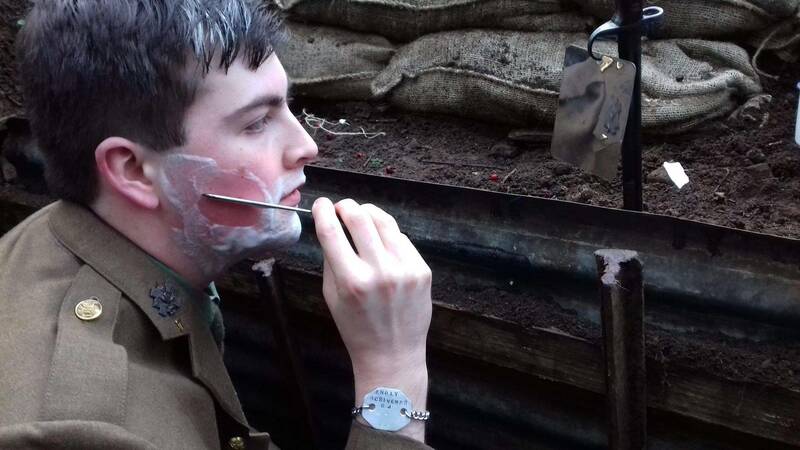 Soldiers were critical of the quantity and the quality of food they received. The bulk of their diet in the trenches was bully beef (canned corned beef, good quality mead), bread and biscuits. Hard tack biscuits were basically inedible when dry, rock hard tooth breakers, they needed soaked in water to make a porridge, or in meat juice to bulk out meals. Don't believe us? Try it for yourself, here's a recipe for Hard Tack. Remember do not try to bite through them when dry, you will break your teeth! When it’s done, you’ll want to let it dry and harden for a few days, just out in the open. When it has the consistency of a brick, it’s fully cured. Then simply store it in an airtight container or bucket. To prepare for eating, soak it in water or milk for about 15 minutes, and then fry in a mess tin. It should keep for oh...a century or so. 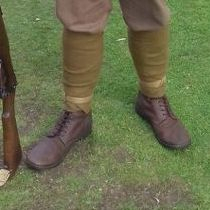 While a soldier's kit was issued to him, officers had to buy much of theirs at private expense, albeit with an allowance from the army. This often led to shortages of certain items, such as service pistols and prismatic binoculars, and so a huge variety of older, sometimes even obsolete equipment was utilised.